Aloe Vera and Grape Juice Drink. Succulent & sweet. No added sugar. 30 cals per servings. All natural. No preservatives. Essential vitamins C+. Great for digestion. Gluten & lactose free. Plant based power Aloe vera is a fantastic little plant. Its soothing taste has been loved all over the world for centuries. The Egyptians even called it "the plant of immortality"! It's the magic ingredient in this outrageously refreshing, 100% natural drink. 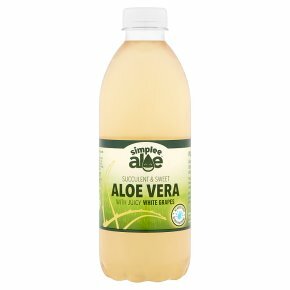 Just 150ml gives your daily dose of aloe vera goodness. Don't stop there though, drink as much as you like!